This delicious recipe is amazingly simple and, for those who are weight conscious , is very low in calories or Syns. It makes an ideal accompaniment to all kinds of grilled or roast meats, fish or a slice of a quiche. You can adapt it by adding some chopped onions, some smoked bacon lardons, different herbs you might have in the garden. Just experiment. 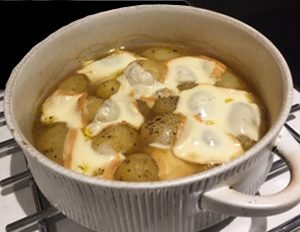 Pour the stock over the potatoes – it should almost cover them . Test the potatoes with a knife – if the knife goes easily into the potatoes they are done. Remove the lid or foil and sprinkle with the grated cheese if you wish.